Intra Venous Administration-The first thing that you may have noticed within any kind of your hospital stay, is hooking you up with an IV. In a medical term, it is being referred to as a drip. It is generally some fluids in plastic bags that have flown through a tube into human body through veins (Intra Venous Administration). You might have several times thought of asking or enquiring about its mechanism and requirement. Read more to find every detail about the same. Humans have natural tendency towards dehydration, which may impair variety of body processes. Without enough passage of body fluids, several things would not have been possible, such as wound healing, immunity building, mental peace, improved digestion, etc. Thus, immediately after your hospitalization, you will be hooked up to a drip to give you better fuel for fighting against infectious attacks, dehydration, fever, etc. Moreover, because of the illness, what so ever, you might not be eating for substantial time; in that sense, the drip hydration can energize as well as add on the nutritional benefits, to hold you on till the treatment. It is the most commonly offered solution through intra venous administration, with the sole purpose to normalize body’s buffering system and add on to its hydration. Due to diseased conditions or dehydration, your cells would have excreted all the salt content from them, building up tremendous osmotic trauma. Due to which, these cells are at increased risk of damage. Accordingly, administration of normal saline can balance out body’s salt and water ratio. Sometimes, dextrose or other sugar substitutes can be offered, depending upon the ailment, which also will be having some kind of salt in it. These administrations are in fact, preferred for people, who don’t have severe infection or dehydration or diabetes. Doctors may be reluctant to administer it, if the patient would be suffering with uncontrolled blood sugar levels, encouraging the chances of other opportunistic infections. Some kind of drips may contain minerals and other electrolytes, such as bicarbonate, sugar and potassium; to be offered in case of severe dehydration. This combination would be preferred choice soon after surgeries, as surgeries can create severe disturbances in acid-base balance of a person. Some drugs and stem cells may also be offered through the same system to optimize their concentration and reachability with increased paracrine effect. If you can see a bright yellow bag, hanging above your bed; it may indicate, your too much inclination towards body fluids. Administration of banana bags, containing multivitamins as well as other fluids are intended to provide you vitamins and nutritional support, after severe dehydration and routine alcoholism. 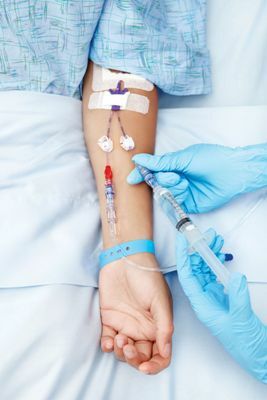 As a matter of fact, each bag of IV fluid is like a medicine and you need to properly educate yourself about what is going on inside your body.